Nomvula Paula Mokonyane was born on 28 June 1963 in Kagiso on the West Rand, Transvaal (now Gauteng). She is the youngest in a family of 12, with six sisters and five brothers. Mokonyane completed her matriculation at Masupatsela High School. Mokonyane started actively participating in the struggle against Apartheid at the young age of 15. She joined the Young Christian Students (YCS). She was a founder member of the Congress of South African Students (COSAS), an organiser in the Federation of Transvaal Women (FEDTRAW) and part of the leadership of the civic movement, the Kagiso Residents’ Organisation. Mokonyane became a shop steward and leader of the Commercial, Catering and Allied Workers’ Union of South Africa (CCAWUSA, now South African Commercial, Catering and Allied Workers’ Union - SACCAWU). Mokonyane was continuously harassed and detained by the Apartheid security police but despite that, she continued to serve in different leadership capacities in the African National Congress (ANC) and its Alliance structures - as a member of the Central Committee of the South African Communist Party (SACP), National Executive Committee member of the ANC Women’s League (ANCWL) and National Executive Committee member of the ANC since 1994. She went to Sweden to train in Local Government and Planning Management and Community Development, and from there went on to do a certificate course in Emerging Economics at Wharton Business School at Pennsylvania University, United States of America (USA). She also studied leadership and governance at Harvard University in the USA. Some of Mokonyane’s most notable contributions during her tenure as MEC for Safety and Liaison were establishing Victim Support centres at police stations throughout Gauteng Province, and the Ikhaya le Themba ('Home of Hope') centre for victims of sexual offences and domestic violence in Braamfontein, Johannesburg. She played an important role in the process that led to Sterkfontein being awarded the status of a World Heritage Site. Mokonyane served in the Gauteng Legislature from 1994 in various portfolio committees before she was appointed MEC for Agriculture, Conservation and Environment in 1996. She became MEC for Safety and Liaison from 1999 to 2004, and was appointed Housing MEC between 2004 and 2009. Mokonyane was appointed Premier of Gauteng Province in 2009. • Gautengonline. Profile of Premier of Gauteng Nomvula Mokonyaneonline. Available at www.gautengonline.gov.za. Accessed on 12 November 2013. • South African Government Information. (2009). 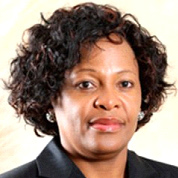 Gauteng Premier Nomvula Paula Mokonyane, Ms. Available at www.info.gov.za. Accessed on 13 November 2013. • Whoswho Southern Africa. Nomvula Mokonyane. Available at whoswho.co.za online online. Accessed on 13 November 2013.